Weight loss in a month: I joined Nutriwell With My Husband for weight loss. I lost 6 Kg in the first month. The results of weight loss diet were awesome. The diet was accompanied with natural Herbs from Kitchen which enhanced the procedure of weight loss. I never knew that simple dalchini ( cinnamon) can have so many positive effects on my body. Specially I want to mention about their services. In our first appointment, Dr Surabhi mentioned ' Client Centric Services'. She told us that Nutriwell's policy is to work on 100 % client satisfaction. In today's world of marketing it was something hard to expect and find. But their services are totally satisfying and completely up to the mark. Our all queries were addressed and to utmost satisfaction. They were available to help whenever asked. I recommended their services to my cousin and she joined their online program as well. She is also very satisfied and happy with the services.I can say that their weight loss diet is best and most economical. Not only did we lose weight but a also discovered a healthier approach towards living. And also we learned so much about food that we didn't know earlier. 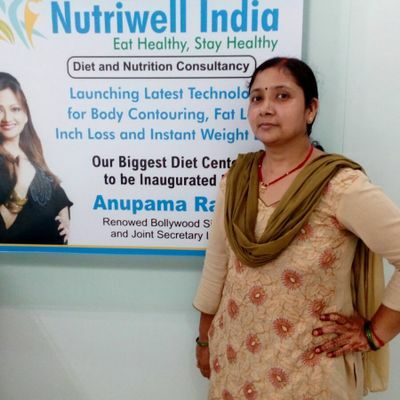 Thanks Dr Surabhi and Nutriwell for helping me achieve weight loss in a month. Thanks and keep up the good work! Recommended to all! Try out guys, you won't be disappointed. You too can achieve weight loss in a month with our diet plans: Check out here!